My aunt invited us to spend the Christmas eve with them but I graciously declined. I told her Nathan won't make it till 12 midnight because he's been sleeping quite early lately. While it is half true, the real reason is that I really just wanted to stay at home for noche buena. We may not have the best Christmas decors nor the most delicious food this year but I want to be comfortable with my two boys. Ok na yun. December 24, 2017. After having lunch with friends, we spent the rest of the afternoon at Metrotown Mall killing time. We shopped a bit and left at around 3:30pm to pick up the cake that I ordered at 4pm. We went home after that and tried to make Nathan nap so he will be awake later that night. But he couldn't sleep. Ford got a call from Grandt Kitchen (a Filipino restaurant here in Surrey) and was requested to pick up the food that we ordered earlier than 6:45pm, so he did. At around 6:15pm, he's back and complained that he's hungry. So instead of waiting for 10pm or 12mn (my original eating time plan), we had early dinner na. Mabuti na rin para bumaba na ang sugar level namin later that night at nang makakain uli. Ang hirap mag-isip nang ihahanda for a party of three, lalo na kapag hindi pa kumakain yung isa at diabetic yung dalawa. We just ordered food sa Pinoy resto because it's practical and economical. Our handa -- pancit canton, beef caldereta, pork sisig, and pork barbeque. We ate in front of the TV watching news. Our plan was to watch all night. As expected, the little boy only ate apples. I was hoping that he'll eat pancit kaso ni ayaw tikman. I'll do a review of our food on my next post. Then at around 8pm I brought out our ultimate holiday cheat foods na. Big time cheating talaga ang plan lol. We ordered this cake from a Filipina home-based baker. Si Jesus pa ba ang mawawalan ng birthday cake? Nathan joyfully delivered a birthday song for Jesus. And the little boy couldn't wait to open his gifts! Ang alam nya kasi pagkatapos magblow ng candle ng cake ay gift-opening na haha! I am thankful that we bought several gifts for him. Enjoy na enjoy siyang magbukas. 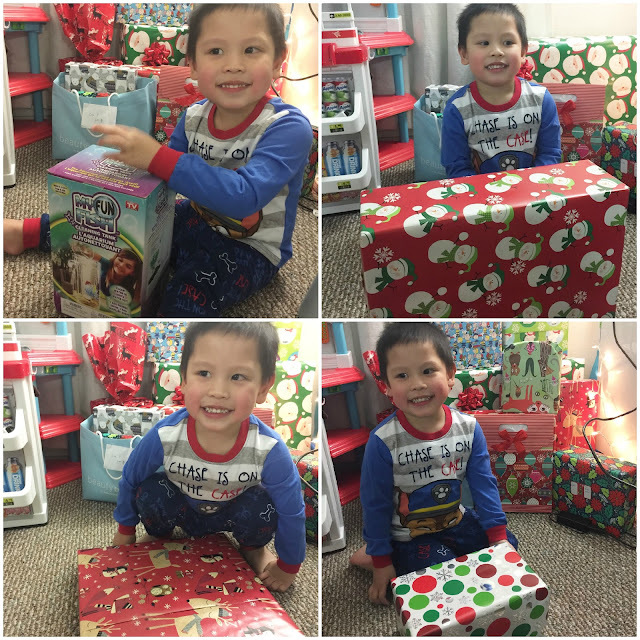 Here are his three major gift requests -- "animals,"hugas-hugas," and "toilet." Paniwalang-paniwala talaga siya kay Santa (I don't remember believing in Santa when I was growing up. Siguro kasi poor lang kami noon haha!). Ford and I also opened our gifts from Juris and Tess. Haha, we didn't have gifts for each other kasi nga wala naman kaming separate money/bank account. Basta I buy whatever I want and tell him gift na niya yun sakin lol. A little past 9pm, we started watching Seven Sundays na. We rented the movie @TFC.TV for $7.99. Medyo pricey pero ayos na rin kasi I've always wanted to watch this film. Pero mukhang mas nag-enjoy ang asawa ko sa palabas haha. Plus he kept on saying "Ang gwapo talaga ni Dingdong" kaloka! I think we'll do this na every Christmas eve, watch Filipino-themed movies. Sana lang palaging meron. Halfway through the movie, nakatulog na ang bagets (not that he was watching lol). Sabi na nga ba eh, hindi nga kasi nag-nap nung hapon. Pack-up na kami around 11:30pm. I had my red day din that night kaya I wasn't feeling well. It was the husband who washed the dishes, salamat naman. My major wish that night was for us to have our own place na (be it a condo or a townhouse) by next Christmas para mas bongga naman ang celebration. Pero kahit simple lang ang naging noche buena namin, I was happy and contented kasi kasama ko ang asawa at anak ko. Iyon naman ang pinakaimportante.